As most devoted margarita fans know, the ‘secret’ ingredient to a truly great margarita is beer. In the so called beergarita the beer provides an excellent sprightly backdrop to the sweet and sour flavors of the classic cocktail. I am definitely a savory over sweet type of person. I’d order another appetizer over desert 95% of the time. This carries over to cocktails and wine. It’s dirty martini over Cosmo. Grüner Veltliner over Riesling. Classic margarita with salt on the rocks over strawberry/mango/you name it frozen margarita. And you already know about me and beer. This is no ordinary beergarita. It is a craft beer cocktail. Why Use Beer in Margaritas? It was at a friend’s summer/garden party. One of the guests was a spirited, beautiful Mexican woman. A celebrity chef from Mexico City as it turned out. She had brought the best guacamole I have ever tasted – it was in a giant bowl with no less than a dozen avocado seeds to keep it fresh. It barely lasted the first hour after her arrival. Perfectly flavored, vibrant looking and matched only by the sparkling pitchers of margarita she concocted every hour or so in response to the enthusiastic requests of the other guests. These are the things I learned from her (with gratitude) on the subject of margaritas. Makes perfect sense about beer and tequila together, doesn’t it? Beer being the typical chaser for tequila shots? It is definitely a twist on the classic margarita and definitely one worth trying. More than that actually. It is a must try, I promise. I used a silver tequila, freshly squeezed lime and lemon juice, simple syrup and beer. But not just any light beer. The Ellicottville Brewing Co. 2 Brothers Session IPA is packed full of American hops flavor and aromas and has an ABV of only 4.7%. With a beer this fragrant I completely omitted the triple sec and splash of orange juice. Session IPAs are crisp and citrusy with low alcohol content. At the same time they are high in hoppy satisfaction. People often refer to them as full flavor, aromatic IPAs that can be enjoyed over longer periods of time (as in will not cause rapid intoxication). Their beautiful aromas are well suited to the sharp flavors of fresh citrus juice and their color, much deeper than that of lagers, adds aesthetic appeal. 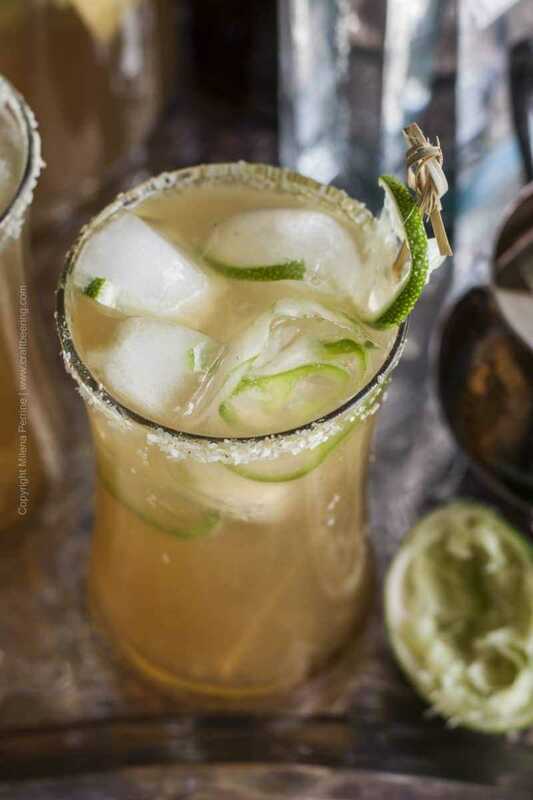 To create an even more noticeable pop of flavors I used our Cascade hops infused salt for the glass rim (perfect, perfect, perfect) and lime and jalapeno flavored ice cubes. I did remove the seeds and ribs from the thinly sliced jalapenos since I was going for just a hint of spiciness. He is not much of a cocktails fan and rarely drinks margaritas – maybe once every three to four years… I am pretty sure that the Session IPA earned me half the credit, but I will take the credit anyways. Aromatic and flavorful American hops session IPA boosts the flavors of this beergarita. 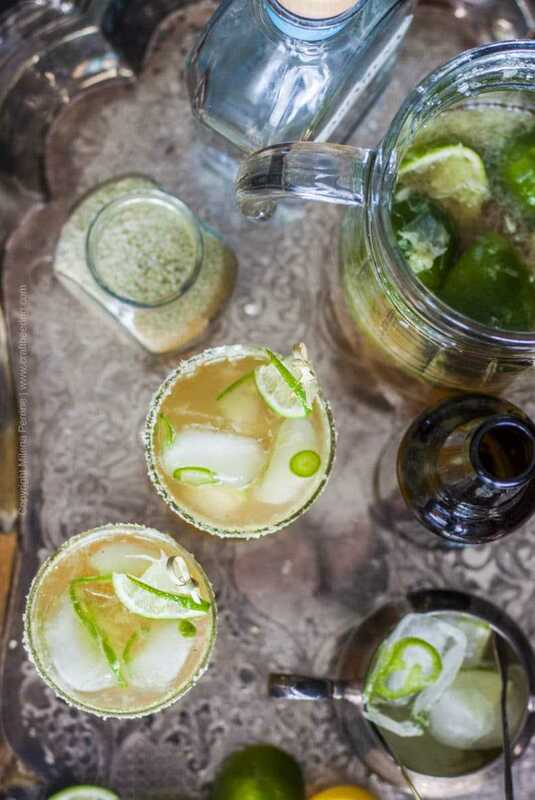 Hop salt rim and jalapeno ice cubes further the fun! In advance: Fill an ice-cube tray with water. In each slot place a thin cross-section slice of jalapeno and/or lime. Freeze. In advance: Bring the water to simmer, add the sugar and remove from heat. Stir until the sugar has dissolved and let cool. 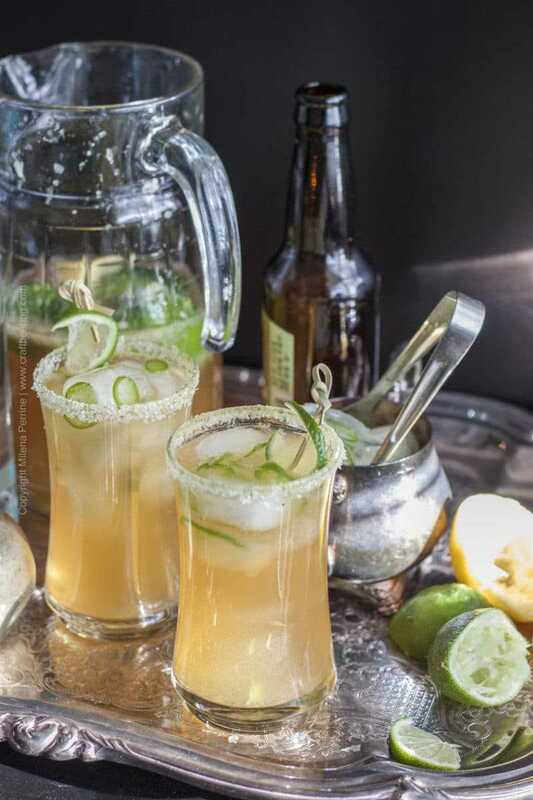 In a pitcher mix the tequila, beer, lime and lemon juice, and the cooled simple syrup. Add the lemon and lime halves for extra flavor if you wish. Pour hop infused salt in a shallow dish/plate. Moisten the rim of each glass with a lime wedge and dip into hop salt. Place 4-5 ice cubes in a glass (use more if you prefer a weaker drink). I love a classic margarita, but you’re right. Beer and margaritas are an excellent combination. Definitely going to have to send this to my husband for his enjoyment. Thanks so much for sharing at the #happynowlinkup! 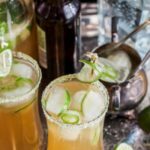 I am usually not a margarita fan, but I love cocktails made with beer! I’m going to have to give this a try! So cool Allison! Beer makes margaritas better, always:) Thank you for stopping by! This would be perfect for today: National Tequila Day!! I wonder if that makes tomorrow National Hangover Day?? Hahaha….this drink looks amazing. Thanks for sharing on Friday Frenzy Link Party! This looks amazing! Love the idea of hop salt! Thanks for linking up to the Friday Frenzy. My whole family will be together next weekend (praying for nice weather) and I know that they would LOVE this! Love the story of the guac and the chef and the perfect margarita… That was a garden party worth remembering! Thank you for sharing! I wish I had been invited to that party! I couldn’t agree more that fresh is best and beer makes a perfect addition to the margarita. 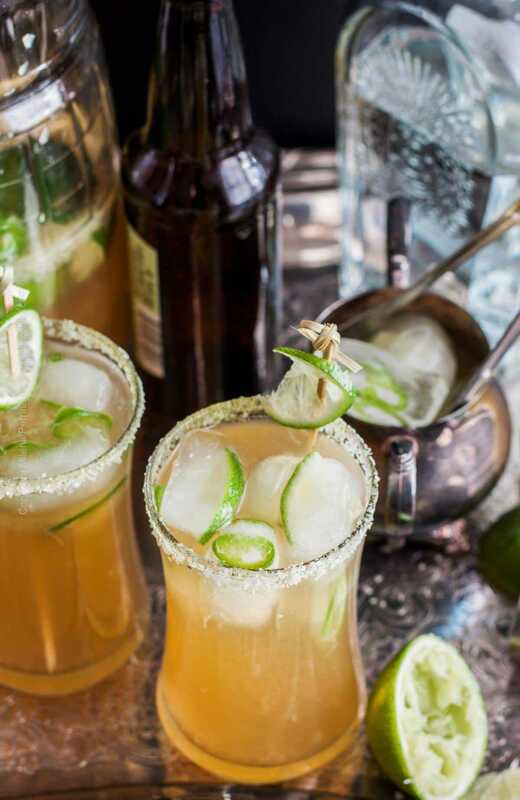 Yours sounds fab – especially with that homemade hops salt on the rim! Cheers! I’ve never had a beergarita before and now I’m wondering why! This looks refreshing as heck! Like you I’m more likely to order apps over dessert (hardly ever order dessert at a restaurant). I do love sweet/savoury combos, but lean more toward the savory than sweet. After hearing you describe that guacamole, all I want now is that and one of these beergaritas. Is it 5 o’clock yet??? Beergarita? Why have I never had this before?! Sounds super tasty and refreshing! OMG! Margaritas are my favorite! I cannot wait to make this version. I don’t think I’ve ever had a beergarita (don’t hate me) but I’m losing my mind over this one! All I want right now is this beauty and a bowl of chips and guac. Have a great day, Milena! I wish you had been over to our house to have one Kelsie! Super smooth and fragrant:) I have a feeling we will be making this again soon, now that Chris has joined me in liking margaritas (…beergaritas).